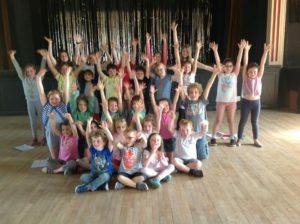 Little Voices Hyndburn’s theatre week involves four days of singing, dancing and acting (9.30am-3.15pm each day, drop off available from 8.30am) with a final performance for family and friends on the last day. They are open to ANYONE (not just Little Voices pupils) aged 4-16 years old! Theatre week is great for building confidence in children, as well as giving children the chance to shine. Our son has only been with little voices for a short time. He attended a theatre week this week and was lucky to be chosen to play a lead part. I’ve seen reviews from previous theatre weeks, but could not believe how fantastic this performance was! The time and effort the staff put into working with the children definitely shows in the performance we watched today. I would encourage any parents wanting to give their children a taster session with Little Voices to do so as the results speak for themselves. Thanks so luck for the hard work you guys do, we will be back next year!! PLACES ON OUR THEATRE WEEKS ARE STRICTLY LIMITED! DON’T MISS OUT!